July, 2009 | ..::CHANGE is INEVITABLE::.. 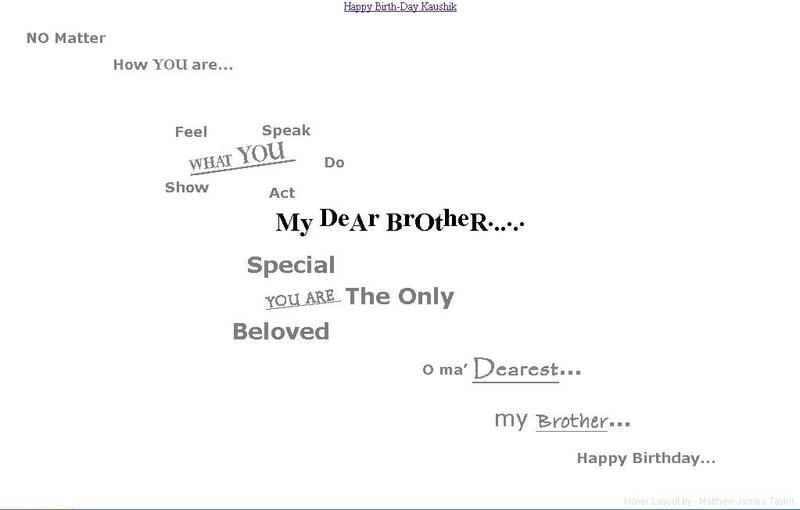 This is an online birthday card wish to my dear brother. Click to view the Online Birthday Card: Happy Birthday Kaushik. Most people find it little difficult to guess the “Functionality” of this birthday wishing card/page. – Mouse hover on “My DeAr BrOtheR……” and Do follow the path properly. No matter Wat-u wear Act sAY shOw!!! I wish this time be yours! You R d Best Bro.!! Love You..